Our great source of comfort, and something that we have a tendency to forget quickly is the omnipresence of God. Our God is already in your tomorrow. He already knows what your future looks like and He has complete control over it. We are told in Jeremiah 29:11 that Jehovah-shammah (the God who is there) says, “For I know the plans I have for you,” says the Lord. “They are plans for good and not for disaster, to give you a future and a hope”. THE LORD IS THERE!! You cannot be in your future now, but He can. You can’t control the future events of your life, but He can. God will walk with you into whatever tomorrow holds because of His great love for you. God is THERE in your tomorrow and in my tomorrow. He simply desires that we trust His heart. Jesus made it clear to us that God is always close, telling us that to pray and seek God because the Father sees in secret… He hears our prayers, sees our actions, knows our thoughts and the intents of our heart. He is always there, watching – and he rewards those who diligently seek Him. But it is not just Him who watches and sees. The prophet Daniel refers to ‘the watchers’, (Daniel 4:13; 4:17) heavenly beings who watch over mankind and God’s purpose and intent. Whether these creatures are angels we do not know, but what we do know is that there are a mind-numbing number of angels. Then I looked, and I heard around the throne and the living creatures and the elders the voice of many angels, numbering myriads of myriads and thousands of thousands (Rev 5:11). It has been said that the number of angels is innumerable but this probably is to reinforce the message of the vast number of heavenly host; all intrinsically holy, accountable to, and under the supreme command of the Lord of Hosts, Jesus. The bible never puts them under our command or gives us permission to send or commission them, they are the bright, shining messengers of God who come to do His bidding alone. Hold that in tension with the truth that ‘all things work together for the good of those who are called’ (Romans 8:28) and you then realise that in God’s providence and sovereignty, these mighty beings cross our paths, more frequently than we imagine. 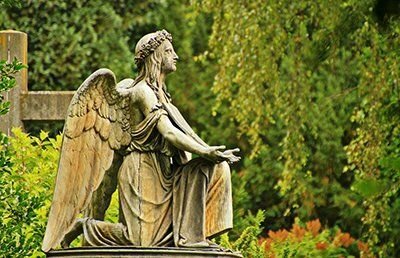 Our focus is never to be on the angels (they don’t come when you say or do what you say), but it is interesting that from the perspective of biblical narrative, whenever God sets about to do something major in His redemptive purposes that the activity of the angelic hosts increases. Angelic ministry is powerful, but of course, not as powerful as Jesus’ ministry. Jesus himself had a number of occasions where angelic assistance was given but it was not something he prayed for or requested of the father, although during the long night prior to the crucifixion Jesus revealed that there were legions of angels available to come to his assistance, all had to do was ask the Father and they would come. What can be said is that an immense, incredible amount of support is available to the Church, and God readily makes it available to watch over and protect the Church. It doesn’t mean that we will never suffer or have lack, but we will have the comfort always of knowing that God has everything in hand, and eternally, God is good. (Nahum 1:7). What really astonishes me is that the bible tells us that one day we will judge the angels. That is stunning. Who am I to even begin to do something like that? Can you imagine that? We will do that as the redeemed of the Lord, and we will do it with extravagant grace and mercy. Angels will be with us for eternity! The issue at hand here that I wanted you to consider is that not only does the Father see in secret, but so do the angels (the enemy too), nothing we ever do goes unseen. If ever there was a call to holiness, this is it. God is watching, along with millions of angels! You are never, ever alone. Keep looking to God – you will not be disappointed.